It seems ironic that when talking about (unofficial no. 2 drivers), Raikkonen has more speed & pace than Bottas, You could expect Bottas to fight for the win whereas Kimi would be fighting for the podium. Thanks, do the timing screen adjus in real time now then as opposed to only finished laps. I am sure I saw vettel as down at S2 but that wouldn’t be possible as his S3 pole time was only 0.007 quicker than Kimi’s first run. Yeah, I think Kimi had a purple in S1 whereas Vettel was doing personal bests in S1 & S2 but did Purple in S3 where he grabbed the pole. Am I right in that in qualifying, Bottas generally seems as good or better than Hamilton when Ferrari are better? Ferrari looked better last year in Russia. Bottas 3rd, Hamilton 4th. Monaco, Hamilton broke down under pressure, Bottas 3rd. Hungary, Bottas 3rd, Hamilton 4th. Then even Mexico when Ferrari were better, Bottas was very close behind Hamilton. Then Ferrari looked better last qualifying in Bahrain, 3rd and 4th in the same order again. And yet again, Ferrari are better here, and same for Hamilton and Bottas.. I honestly think Bottas possibly has better 1 lap pace than Hamilton when Ferrari is a better car, but what sense does this make? Does Hamilton just sometimes struggle when he's not far better than everyone else? I think it also has to do with the particular issue which makes the Merc slower, basically ithas to do with their driving style. In Singapore last year Lewis was much quicker than Bottas even though the Ferrari was faster there. I just think sometimes the car suits Lewis and sometimes it suits Bottas better. But when the car was at his best Lewis is more comfortable with it. This weekend the Merc just refuses to turn in. Lewis reportedly suffers more in an understeery car. He is known to like a loose rear end. Singapore was one I forgot about, but it certainly seems like the majority of tracks that Ferrari have looked stronger in qualifying, Bottas has got the better of him. I dont agree. It’s about 50/50 and even that relies on Bahrain where Hamilton was up against it. Mexico last year.. +0.020 Hamilton was also 0.250 up on best sectors but made an error on his final run trying to chase pole. Well I don't really think Malasia or Mexico is valid for the way I am comparing things. I am not convinced Ferrari were much of a threat in qualifying there. End of Q1, Hamilton 1st and Kimi 0.654 in 4th. Q2, Bottas on top with Kimi in 2nd, 0.123 behind. Hamilton's first run in Q3, he was faster then Kimi by 0.232 seconds. Then Kimi managed to get to being 0.045 bhind Hamilton. I know it isn't much but I'm not sure Ferrari were better. But yes, Bottas had a bad Q3. And The Ferrari did look quicker in mexico in qualifying. And yes, Hamilton made a mistake. But I think it is when Ferrari is quick when Hamilton makes more mistakes. And Bottas was 0.024 behind Hamilton in the end. An example that in this situation Hamilton was more close to Hamilton. I still think that the majority of the time Ferrari are stronger, Bottas is as good or better than Hamilton. That is in qualifying though. Why is Mexico not valid? Ferrari were on pole. That was your very own criteria. Then you go on to say Hamilton makes more mistakes in these scenarios but the 2 major examples (monaco 2017, Russia 2017) are nothing to do with mistakes, he was just really bad with the tyres over 1 lap throughout the entire weekend and slow. Kimi missed pole by 0.045 in Malaysia yes, so is that not a strong Ferrari? By the way, Ferrari only ran full mode in the 2nd run in Q3 in 2017. So they always improved on the 2nd run. Mercedes ran full mode both runs. So that comparison you make is pretty meaningless. What Bottas did in Q2 is irrelevant in Malaysia, did you notice who was top of Q2 today and where they ended up? What about the times Bottas beats Hamilton when Ferrari aren't strong? My point was that Bottas generally was very close or ahead in these situations. In Mexico, this was the very close occasion. I shouldn't have implied it didn't count. Maybe some of the races where this similar thing happened such as Monaco and Russia were just a coincidence, but given there have been quite a few times where it had happened, I did wonder if it was relating to the Ferrari's being strong that makes Hamilton occasionally struggle. And I sometimes do believe this is the case. Guess we think different. The list of races where Mercedes were beaten to pole since Bottas has been with Hamilton: Last year: Russia, Monaco, Hungary, Singapore, Mexico. This year so far, Bahrain and China. 5 out of 7 of them, Bottas beat Hamilton. One Hamilton was far faster than Hamilton and the other (mexico), Hamilton was faster by a tiny margin in the end). But 2/7 isn't exactly much in Hamilton's favour. And I don't think we can really blame his setup in Bahrain. His lap looked fine in the last sector as he went purple. But he made an error earlier and slipped in a few places. If he managed to do so well in the final sector, I don't think his setup was limiting him. But his mistake was enough to make him slower than Bottas. The qualifying battle between Bottas and Hamilton wis now 14 - 9 to Hamilton. This shows that there were only 4 other occasions where Bottas beat Hamilton. Bahrain, Austria, and the final 2 races of the season. So given that most of the times Bottas beat Hamilton was when another team was on pole and probably was quicker to me indicates Hamilton could well have a slight weakness in this area. Given that he only beat Bottas on 2 of these occasions. You can add in Malaysia if you want as maybe that was a track where Ferrari were very strong in qualifying, But I still think Bottas is slightly better than Hamilton in qualifying from what we have seen when in this situation. It is a bit strange. We will have to wait and see, its the causality of it that I do not agree with at all. Do you think if both Ferrari's broke down in Q1 today, Hamilton would magically be quicker than Bottas? Of course he wouldn't. The speed of the Ferrari is irrelevant. It's refreshing to see Ferrari dominating Mercedes. It surely is not. Atleast in Mercedes the drivers gets to race each other. This is exactly my point. I don't want to say that it is certainly the case. But I do feel that it is this that could possible be making Hamilton try harder, which I think has definitely sometimes made him do worse than Bottas. yeah, because we've had so much of Bottas racing Hamilton? Fine, let me word it differently. In Mercedes if Bottas is ahead you know Mercedes won't deliberately throw his chances of winning out the window in the pits, or some other way. Ferrari does that fairy cakes to Kimi everytime he is ahead of Vettel and they can get Vettel to win. The only time Kimi can get a win is if Vettel is out or too far back. I think a more accurate description would be that Hamilton’s advantage over Bottas shrinks when Mercedes struggles, and Hamilton’s advantage increases when Mercedes is planted and is the best car. I agree claiming that Bottas is outright better than Hamilton when Merc struggles is a bit of a stretch, but not an idea that came out of nowhere. Hamilton is weaker against Bottas over 1 lap when the softest tyres are used. It was the same with Rosberg. Whether Ferrari are 0.5 ahead or behind, that doesn't change much. Watch his laps in each of these sessions, he isn't making mistakes, Bottas was just quicker. You don't think Bottas can beat Hamilton without Hamilton making mistakes? of course he can. The same for Raikkonen and Vettel. Bahrain 2017, Bottas also beat Hamilton and Ferrari were 0.5 behind. If Lewis had opened his DRS he would have been about -0.050 quicker than Bottas. In 2018 he had no warm runs in Q2 on the qualifying tyre and a car setup to not run the SS in the race and required to overtake. Bottas beat him by 0.076. If you weigh those performances up, Hamilton was better in 2018 for me or at least equal all things considered. China 2017 Bottas was 0.180 off in qualifying which has turned into 0.050 ahead in 2018. However, when on the soft Hamilton was 0.150 ahead. 2 steps softer for qualifying tyre here is also something the FIA have never done and this tyre is far too soft for this track, it is lasting 6-7 laps on a long run. No they don't. They didn't wave Vettel by in China last year, they didn't in Silverstone last year, they didn't in Australia this year. You don't like Vettel, we get it, but stick to facts. Makes for better discussions. When the topic of Ferrari team orders comes up, it seems like some people are still stuck in 2002. When Raikkonen and Massa were evenly matched in 2007/2008, Ferrari gave both drivers equal opportunity to fight for the WDC until one driver was realistically out of contention. Alonso and Vettel are simply a lot better than Massa and Raikkonen. This has nothing to do with Ferrari’s number 1 driver policy or anything, the difference is simply driving ability. I heard some journalists debating this earlier on a podcast, and one of them was making similar points to what you’ve posted. I think it’s a combination of trying too hard and the things Nico noticed when competing against him - that Hamilton goes missing at times and loses focus. The Ferrari looks mighty at the moment so it looks like Hamilton will have to get used to competing for third this season. If he doesn’t want to lose to his teammate he’ll have to find a way to motivate himself. The onboards look so awfully un-racy with the halo. I agree the halo is an eyesore on the onboards, but how does it make the cars look any less racy? Ferrari signed Raikkonen as a number 1 and Massa as a number 2, the problem was, Massa was just as quick if not slightly quicker so they got forced into that. Massa was generally quicker in the dry, but more error prone and useless in the wet. They had two 1.5's. That was soon rectified, they were trying to get rid of Kimi 1 year after he joined. Ferrari achieve theri number 1 and number 2 status by driver ability. Why do you think Barrichello was kept on for 6 seasons and Massa 8 seasons? Last edited by lamo on Sat Apr 14, 2018 10:36 pm, edited 1 time in total. Lost or gave away? I'm still not convinced Ferrari are allowing a straight competition either in qualy or race, although if it was given away he didn't give away much. You'd have to admire the Ferrari engineers for their precision if they engineered the pole for Vettel by just under a tenth. In that respect, you have far more faith in their abilities than I do. I would love if the FIA forced teams to release telemetry data after every race weekend. To me it didn't seem like Kimi made a mistake, was there a mistake or did Ferrari do something shady like remotely turning his engine down by a notch in the final sector when they saw that he might beat Vettel? Kimi was 4 kmph slower down the straight than Vettel, you see Vettel reel him in on the back straight. Kimi starts it about 1-2 lengths ahead and ends it a car length or 2 behind. Just viewed the side by side and he gains 0.125 on Kimi there. Its not as if he got a better exit either because Kimi is actually extending the gap as they exit the corner. Its probably wing settings, maybe they gave Vettel more mode. Who knows. 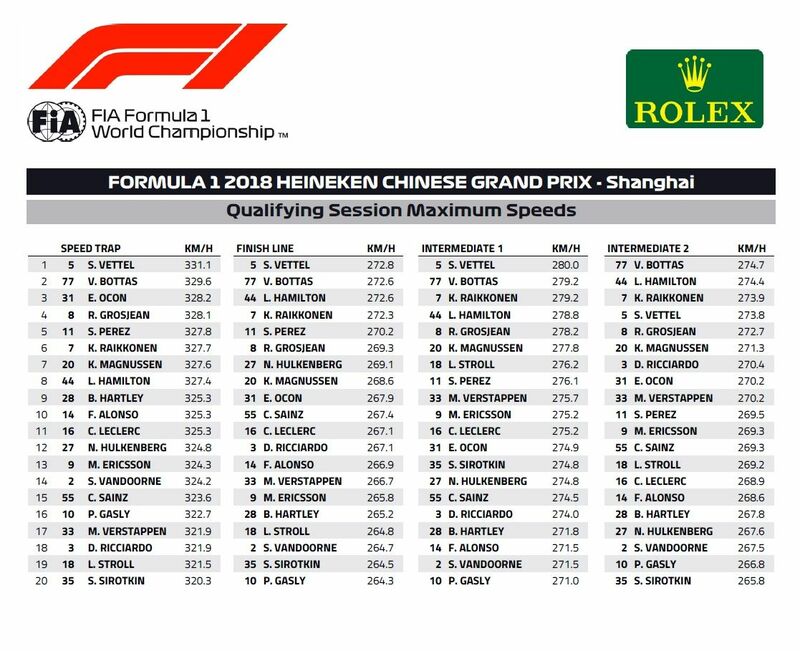 Keep an eye out on top speeds between Kimi and Vettel in the race for confirmation. The bold is not necessarily a fair argument. David Coulthard drove the most races for McLaren in history, a team that takes pride in giving both drivers equal treatment. Barrichello was a very competent driver who did his job as asked. There was no reason to ruin the team harmony. When Rubens was initially signed in 2000, he was rated very highly. Ferrari sacked Massa in 2013 and gave the second seat to Raikkonen, who just revived his reputation with Lotus. Yes indeed. But that does not change the facts at all. You can achieve a 1-2 by signing drivers of different ability. Why wasn't Alonso, Raikkonen or Montoya signed to replace Barrichello. Why was a lowly rated Massa used to replace Barrichello? Why was Webber retained when he was finishing races in 4th and 5th when Vettel was easily winning. All the same reason. So taking it back to your origianl statement; Alonso and Vettel are simply a lot better than Massa and Raikkonen. This has nothing to do with Ferrari’s number 1 driver policy or anything, the difference is simply driving ability. The policy is to sign drivers of different ability to create the 1-2. Its a very successful way to win championships, the last thing you want is drivers taking points from one another within the same team. Ferrari NEVER intended to drop this system after Schumacher it was forced upon them by Kimi not meeting expectation and he was promptly got rid of - literally paid to not drive the car. Regarding Mclaren, how did they last win a title? By having two drivers of different ability allowed them into a title fight without the best car against a team employing equal treatment. How did they last lose a title they should have won - by having two drivers of similar ability. Coulthard was also not on Hakkinens level during the championship years. Hakkinen had 8 wins, DC 1 in 1998. 5-2 in 1999. 13-3. Interesting wasn't it? I think it's just the deployment schedule. Kimi looked faster in the short straight after turn 2 even though Vettel had a better exit, then Vettel beats kimi on the back straight after Kimi had a better exit. I guess they don't use the same deployment schedule on both cars. Why? I'm not sure. But Ferrari cannot remotely turn the engine down. That is not possible. I don't really know what to say to this. I'm hoping your joking , because the alternative is sheer desperation to want to believe in conspiracy theories. Kimi lost out by less than a tenth. How on earth do they engineer that? It's unlikely to be wing settings. Kimi was faster in his previous lap and he went purple everywhere. Why would they feel the need to make an adjustment after that? There was nothing preventing Kimi from getting the time. This is proven as he did it on the previous lap. Why is it so hard for people to accept that he just didn't hook it up properly? Merc dropped a bollock not bringing in Hamilton. Why is it unlikely? Pretty clear, Kimi was slower on all the speed traps and he was quicker than Vettel in the sectors that favour more wing, S1 and S2. It's unlikely because he was already the fastest out of everybody in every sector. And on his final lap he still managed to go faster still in the first two sectors, but slower in the final one. The one with the straights. A wing tweak to help his top speed should have improved that, not made it worse. The simplest explanation is the most likely here. He simply didn't get the best exit and that compromised his lap. Have you actually watched the side by side? The one with the little car that uses GPS to show exact progress. He is pulling away on the exit, extending the gap. He gets a better exit than Vettel. Its from about 1/3 down the straight where Vettel's straight line speed kicks in. Pretty obvious from this. They are tied in the mid corner, as they exit the corner Kimi pulls 0.040 ahead. Kimi is still pulling the gap as they are on the straight. Then Vettels lower drag kicks in and before they brake Vettel has gained 0.120 on Kimi turning his 0.040 deficit into 0.080 ahead. In doing so posting a top speed 3.7 kmph higher. As you say, the simplest explanation is the mostly likely.